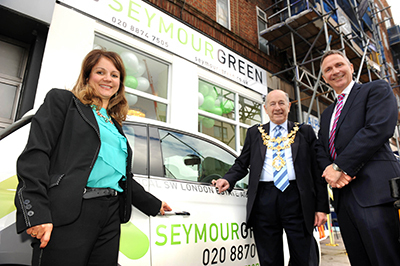 Family run estate agency Seymour Green is opens a new office in Putney. The company, which has been serving Wandsworth and Southfields for over five years, is now expanding into Putney. Their new office, on the Upper Richmond Road, was officially opened on Monday 23rd February. Local business owners and residents were invited to pop in for a cup of coffee and a slice of cake, or pick up some goodies for the children and join in the party. 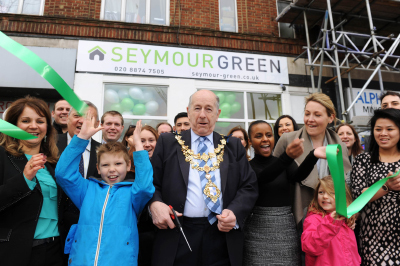 Then, just after midday, The Worshipful the Mayor of Wandsworth, Councillor Mr Stuart Thom, came along for 'cutting the ribbon' and declaring the new premises officially open. "Over 50 local business owners and friends came along to the launch and it was a wonderful celebration for the staff and community. The Mayor was very engaging and lots of fun was had whilst taking photographs and cutting the ribbon'' said Adele Brown, Director, Seymour Green. Seymour Green plays a very active role in the local community supporting The Wandle Trust and The World Heart Beat Music Academy. Their ethos is, and always has been, about localness; living and shopping in the local area and supporting local people. "We love meeting people and hearing their local stories. Putney is a great place to live and work; it's well connected, there is green space on the doorstep, a strong sense of community and great shopping and dining. No wonder it's such a popular area." said Colin Brown, Director, Seymour Green. Seymour Green prides itself on its ties to, and dedication to, the local community it serves.